Beautiful distinct contrasting colors in this specimen from Florida. Very few ever this exceptional. Suitable for private collections or as a wonderful gift! Ships with information, tag and certificate of authenticity, in a quality box. Stands for fulgurite and tag included. 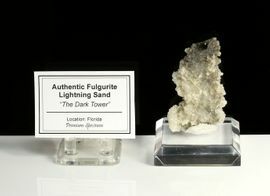 The Lore and Folk History of Lightning Sand: Promotes Good Luck, Success, Insight,Serendipity, Inspiration, Enthusiasm, Creativity, and Good Luck. The real "Sweet Home, Alabama" authentic fulgurite lighting sand!